Costume Quest is a short, easy game that plays like Final Fantasy on training wheels. And it's the best game Double Fine has ever made. 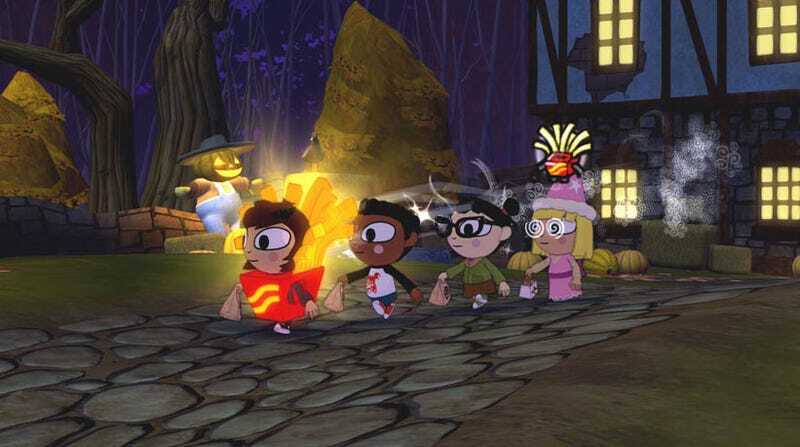 Costume Quest is a role-playing game in which you take control of a group of kids out on a Halloween rescue mission. They may be small, but the game's hook is that once they enter battle, they transform into the thing their costume represents, pint-sized children becoming giant robots, ninjas, space warriors and...unicorns. You may think the ideal player is a Double Fine fan, but really, I think the perfect customer for this thing is a parent who loves role-playing games and wants to play one with their kids. That or someone who likes the idea of a JRPG but doesn't like the baggage. Costume Quest is the first of Double Fine's new breed of games, in which the developer eschews larger titles in favour of smaller, less risky games. As stated above, these are the guys who made Psychonauts and Brutal Legend, so seeing them tackle a role-playing game in the vein of Final Fantasy is something worth taking a look at. Plus, this isn't a game about teenagers battling an empire in a far-flung fantasy land; it's about some kids running around town dressed in Halloween costumes. Wait, it's like Final Fantasy? Pretty much. Costume Quest is a Japanese role-playing game in spirit, but is more notable for what it cuts out of the traditional JRPG than what it retains. There's basic exploration, rudimentary mini-quests and turn-based battles, but so much of the genre's dead weight - random encounters, grinding, clumsy inventories and complicated skill trees - have been trimmed, leaving a far tighter and more enjoyable game than you'd expect. Can you give an example? Sure. You will never once be walking around and have a battle forced upon you. Costume Quest's encounters are triggered by knocking on the door to a home or store; if a human answers, you get candy, if a monster answers, you fight. Stages can only be cleared by knocking on every door in the level. It's a genius move, because it retains the tension of a random encounter, but loses the inconvenience. Costume Quest has French Fry spider monsters. Oh yeah. Does this make it easy? Oh, so easy. Costume Quest will be over in around six hours, and not only is it easier to play because you don't spend half the game in an inventory screen, it's easy because the battles aren't too challenging and the "puzzles" are simple acts of conversation and exploration. Be warned, JRPG fans, this game was not made specifically for you. It's more Pokemon than Final Fantasy. Did you say no grinding? I did, and now let me qualify by saying it's mostly free of grinding. Using the standard costumes you accrue along the way and only the most basic of the game's battle stamps (power-ups and special moves), you can reach Costume Quest's final boss without losing an encounter. That final boss, though, will need some more advanced suits and stamps, so it's back to the earlier stages to improve your kit. It's an annoying finale to an otherwise breezy game, because if you spend 5.9 hours enjoying (and getting used to) the fact you don't have to do a ton of non-essential stuff, having to backtrack at the very end is a bit of a shame. How is this Double Fine's best game? What about Psychonauts!!!!!! Let me explain. Psychonauts (and Brutal Legend) were amazing worlds bolted onto average games. People remember (and adored) the characters and the humour, not the tedious platforming and dreary combat. Costume Quest has a charm all of its own, yes, but its clever paring-down of role-playing game standards and brisk pace mean you'll enjoy the nuts and bolts of this game as much as its subtle humour and giant robots. It's a Double Fine game, so does that mean it's funny? Sort of. You won't laugh out loud very often, if at all, but the game's sense of humour is more in line with that of Psychonauts, with an emphasis on wry gags that leave you with a constant smile as opposed to big, obvious jokes. Costume Quest seems like a surprising move from Double Fine, delving into such an unexpected style of game. Yet by applying their own unique slant on a setting and showing other developers how the fat can be trimmed from such a bloated genre, the game stands proud as Double-Fine's smartest - if also shortest - title to date. Costume Quest was developed by Double Fine Productions and published by THQ for the PlayStation 3 and Xbox 360, released on October 19. Retails for $15. A copy of the game was given to us by the publisher for reviewing purposes. Completed Xbox 360 version of the game, with my favourite costumes being the Pumpkin, Robot and French Fry Spider.